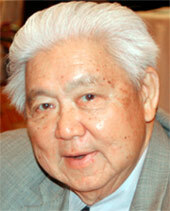 With the passing of Sheriff Harry Lee, we have lost a cherished friend and devoted patient. For nearly three decades, Harry Lee served with honor and distinction as the Sheriff of Jefferson Parish. It was our privilege to have provided eye care for Sheriff Lee for many years. It was a great honor to have Harry as a friend. The son of Chinese immigrants, Harry Lee was born in the back room of his family’s laundry on Carondelet Street in New Orleans in 1932. When they were old enough, he and his siblings, eventually numbering eight, were given jobs in the laundry and later in the family’s restaurants, including the House of Lee in Metairie. He got a firsthand taste of politics early, at age 12, when he was elected president of the newly formed student body government at Shaw Elementary School. Each year after that, he was elected to class office. During his senior year at Francis T. Nicholls High School, now Frederick Douglass Senior High School, he was president of both his senior class and the student body, a school first. Harry Lee received a bachelor’s degree in geology from Louisiana State University, did a short stint in the Air Force in Texas and married Lai Lee, then returned to Louisiana in 1959. That was the year that the family began construction on the House of Lee, where Mr. Lee would meet the man who became his political mentor, U.S. Rep. Hale Boggs, D-La. He learned much about public service and politics from Rep. Boggs and Boggs’ widow, Lindy, who succeeded her husband in Congress. For six years he worked as Hale Boggs’ assistant and confidant when the congressman was home in Louisiana. He took classes at Loyola University School of Law while working 12-hour days at the family’s restaurant. After law school, Mr. Lee set up a small practice with classmate Marion Edwards, now an appellate judge. With Boggs’ help, Mr. Lee was appointed the first magistrate for the U.S. District Court in New Orleans, and in 1976 he became chief attorney for Jefferson Parish. Four years later, with Sheriff Al Cronvich embroiled in a wire-tapping scandal, Mr. Lee saw a chance to run for elected office. Criticizing the corruption and inefficiency of the Sheriff’s Office, he ran as a reform candidate, led the five-candidate primary and took 57 percent of the runoff vote to defeat Cronvich. He immediately gave deputies raises and poured money into the Sheriff’s Office, computerizing it for the first time. During his tenure, Sheriff Lee invested heavily in computer services and modernized the Sheriff’s Office. His office usually boasted an impressive homicide solve rate of more than 90 percent, and he oversaw an aggressive strategy of tracking down and prosecuting career criminals. Sheriff Lee was the second longest-serving sheriff in Jefferson Parish history, after Frank Clancy, whose 1928-56 tenure he would have surpassed in a matter of months. Overwhelmingly, the people of Jefferson Parish felt safe due to the efforts of Sheriff Lee. The new sheriff of Jefferson Parish, Sheriff Newell Normand, worked with Sheriff Lee for many years and was Harry Lee’s choice to be his successor. Sheriff Lee is survived by his devoted wife of many years, Lai Lee. He is also survived by his beloved daughter Cynthia and son-in-law, Stewart. He had two cherished grandchildren, Gavin and Miranda.